I’m a swimmer. I swim 30 laps, 4 days a week. My goal is 40. The water is my zen and swimming is my “me” time. When I’m in the pool, I’m in the zone and if I hit my stride just right, I feel as if I’m flying. I grew up near the Atlantic ocean and always lived near a moving body of water. In a different article at a different blog I might write about how the ocean changes you. It shapes your personality in profoundly subtle ways. It patiently teaches you about life and so on. This was my favorite part of Rick Veitch’s Aquaman run. He took those concepts and mythologized them into Aquaman’s book. So it was with curiosity and excitement that I picked up Johns’ and Reis’ take on this character I love. They are two creators with a great track record and have made comics which have appealed to me greatly in the past. Aquaman #1 is essentially an entertaining “who’s who” entry. It book ends a character study with two dollops of plot involving a race of sea monsters who come up from under the deep sea floor for the first time. The monsters make it to the ocean’s surface and after killing a fisherman make the casual observation: “There’s food up here”. It’s intriguing but slight. What happens elsewhere is where the book strives to compel you. 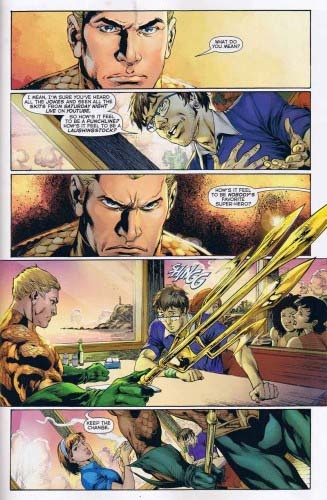 Aquaman – Arthur Curry – foils a robbery in Boston. Neither the cops nor the criminals give him much credit, mocking him with the usual jokes: “Do you want a glass of water or something?”. Roughly the same thing occurs in a seafood restaurant where Arthur’s adoptive human father used to take him. A blogger interrupts his lunch with annoying and awkward questions: “What’s it feel like to be a punchline?” But Aquaman has a lot on his mind and mostly responds by stubbornly brooding. Cut to a scene at the lighthouse where Arthur grew up. He and his love interest, Mera, discuss the weight of responsibility and the decision to leave Atlantis behind to start a life on land. Reis brings it as he generally does. His strength is in the storytelling and in creating a very tangible sense of location and drama. His style might be described and cinematic but in the way that ignores the inherent potential of the comics medium. He does a lot to liven up this breezy script. As nice an intro as this is (Aquanoobs would probably like this book) I think I’m choosing to be somewhat disappointed. I understand and respect the need to get readers “up to speed” and as far as that goes, it’s well done. But it seems to me like there’s room here for much more wonder and fantasy. Is Johns hoping to “ground” Aquaman to render him more accessible? I don’t know. If yes, I’m less excited. Putting a former King in a shorefront dinner seems like a clever idea in theory but after reading the book, my interest in Aqualore is left unsatiated. I already think Aquaman is cool but instead of a book where Aquaman does a bunch of cool things, I got a story about how people think Aquaman is uncool. Other than serving this purpose, most scenes in this comic seem to have no overall meaning other than to prop up a few pieces of key dialog. If I was perhaps less of an Aquafan, this might have appealed to me as an introduction to the character and I might have been more amused at the pop culture references. But as it is I’m not satisfied in this admittedly solid start to a title. Issue #2 needs to be heftier with tighter and more meaningful action to win me over. Bummer Jason, I know you were looking forward to this book. Sorry it was not all it could be. Go ahead and write a capsule for it if you like Mike. Always nice to read different opinions. I’ve actually heard really good things about this book. I didn’t pick it up…but I think I might. My guess is that they’re going to ease into the lore, so that new readers have a chance to get their sea legs (pun intended…). As an “Aquanoob” myself, I have to say I did enjoy it. Although, I did feel like there was something missing. I just read this Jason and I got to say you were right on. Too much of this book was about how uncool Aquaman is. They didn’t need to explore this at all as they had a clean slate to work with. I like Johns writing, but I never feel like I get my money’s worth with these single issues. It’s way to fast a read. Won’t be picking the second one up. I can see a passing nod to the “aquaman is lame” meme but it had too much of the book focus on that.